Recipients of the Catherine and Archie MacPhee Awards and the Rev. B.A. MacDonald Memorial Bursaries, include, l-r, Joseph MacMaster, Abigail Law, Hannah Krebs, Jamie Samson, Clare Quirk, Emily Matthews, Kenzie MacNeil, Catherine Culhane, Sarah Furness and William Kehoe. 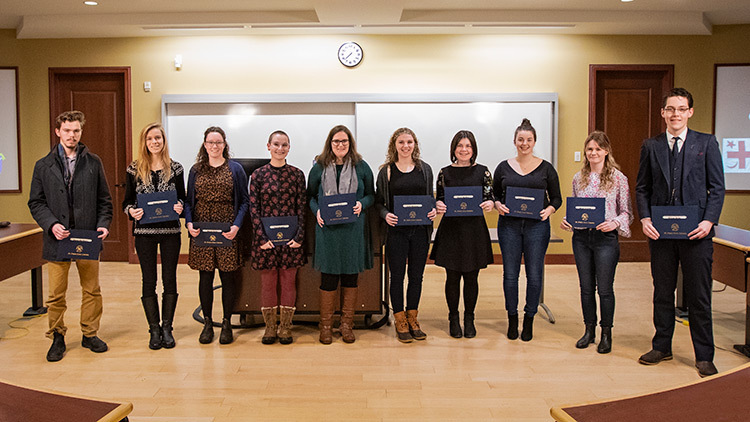 A number of StFX students, who are making a significant contribution to Christian and intellectual life, were recognized on Jan. 22, 2019 when the Catholic Studies Program presented 10 students with bursaries as recipients of the Catherine and Archie MacPhee Awards and the Rev. Bernard A. MacDonald Memorial Bursaries. The awards commemorate Archie and Catherine MacPhee, the parents of Rev. Norman MacPhee, and Father Bernard A. MacDonald, who was a professor of moral theology at StFX until his death in February 1998. The Rev. B.A. MacDonald Bursaries and the Catherine and Archie MacPhee Awards recognize and support undergraduate students who have an interest in Catholic Studies, philosophy, or moral theology, and who have made or are making a significant contribution to Christian intellectual and spiritual life on campus or in their home community. This year’s recipients include Joseph MacMaster, Abigail Law, Hannah Krebs, Jamie Samson, Clare Quirk, Emily Matthews, Kenzie MacNeil, Catherine Culhane, Sarah Furness and William Kehoe.